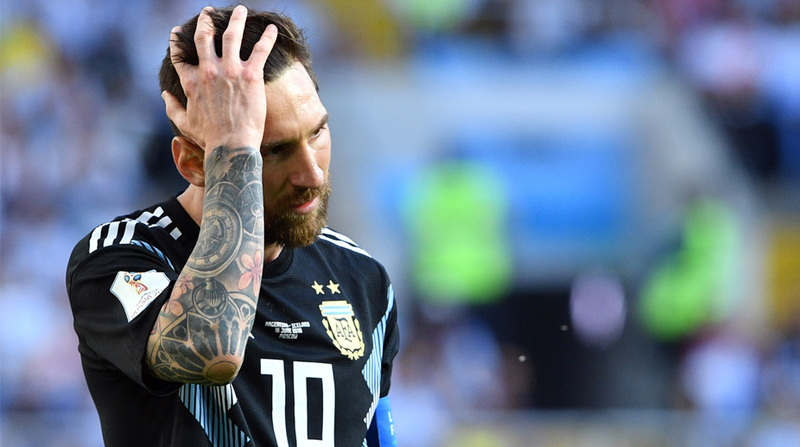 Argentina superstar Lionel Messi missed a crucial penalty as La Albiceleste were held to a frustrating 1-1 draw by plucky debutants Iceland in their 2018 FIFA World Cup Group D opener at the Spartak Stadium on Saturday. After impressing in their warm-up fixtures, Jorge Sampaoli’s men were expected to make short work of the Icelandic minnows and after Sergio Aguero masterfully fired the South Americans into an early lead, it looked like a rout was on the cards. However, the surprise package at the 2016 Euros weren’t done and, helped by some suspect defending, they levelled proceedings in the 23rd minute via striker Alfred Finnbogason. The South Americans were dominating the possession stats, with Messi coming close to opening the scoring on a number of occasions from distance. However, Iceland had a few chances of their own as they sought to hit their fancied opponents on the break. Defending deep and in numbers, Iceland saw out the first-half without much fuss as they likes of Angel Di Maria and Maximiliano Meza flattered to deceive. The second-half began with Argentina pressing even higher up the pitch and you could have been forgiven for thinking it was an ‘attack vs defence’ training session, such was the dominance of Messi and Co.
And in the 63rd minute, Iceland’s good work seemed to have come undone as they gave away a penalty and with Messi stepping up, it looked like a no-brainer that the Rosario native would put the ball into the back of the net. It wasn’t to be as Messi failed to emulate arch-rival Cristiano Ronaldo’s goalscoring feats from Friday night as his tame effort was well-saved by Icelandic goalkeeper Hannes Halldorsson. Sampaoli should then have thrown the kitchen sink at the tiny European nation, but the Chilean tactician’s caution got the better of him as his uninspired substitutions failed to make a significant impact. Juventus sensation Paulo Dybala didn’t even come off the bench, as the the likes of Gonzalo Higuain, Ever Banega and Cristian Pavon failed to make the most of their chances in the second half. There was still time for a controversial incident in the tie as match referee Szymon Marciniak waved away appeals for a penalty after Pavon had been tumbled in the box. Replays suggested minimal contact had been made and perhaps on another day, the decision would have gone Argentina’s way. As it was, the sides shared the spoils, thanks in no small part to an impressive rearguard action from the Scandinavians. A draw it was, but a defeat it will feel like for the two-time champions while Iceland will definitely go back to their hotel with a bit of swagger in their steps.